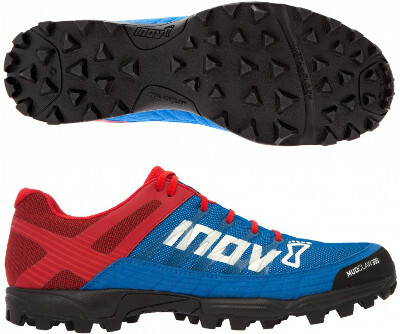 Inov-8 Mudclaw 300 are neutral trail running shoes. The renovated Inov-8 Mudclaw 300 pretty much shows why Inov-8 was created back in 2003: high quality shoe made to enjoy running in muddy terrains where great grip is absolutely mandatory. Not the first Mudclaw out there, many may be familiar with impressive Mudclaw 330, lighter Mudclaw 265 and also previous to current 2015's edition Mudclaw 300 which gained almost the same popularity as the famous Salomon Speedcross 3. For those who are not used to model names from british brand, number indicates weight (in grams) for UK 8.5 size. Upper in Mudclaw 300 is clearly divided into two areas with more breathable and flexible one treated with DWR (Durable Water Repellent) coating in the forefoot and a more rigid for improved stability around the heel in the rearfoot. Both sides and toe cap have been reinforced for enhanced durability. Traditional nylon lacing system provides a secure and custom fit adjusting synthetic webbing upper that supports the forefoot (Met-Cradle™). Mudclaw 300 features 2 arrows in Inov-8's ShockZone system which means a perfect blend of responsiveness and underfoot protection mixing typical EVA foam with 3-finger polymer (Meta-Shank™ Gen I) for increased flexibility. Outsole is the most aggresive among Inov-8 range with multi directional 8 mm's stud pattern that deliver the best grip possible over muddy terrain.